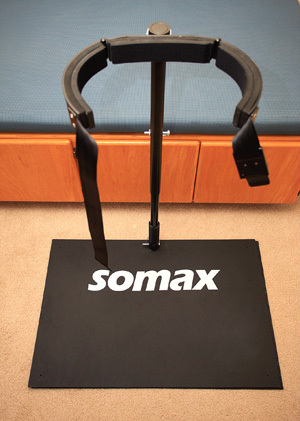 "The Somax Power Hip Trainer is the first golf exercise machine to help golfers attain the hip and swing speed of the top pros." Somax Performance Institute, the world leader in analyzing, measuring and improving the golf swing, is proud to announce several gifts that will help every golfer improve his game—or money back. Do golfers complain about lack of distance off the tee? 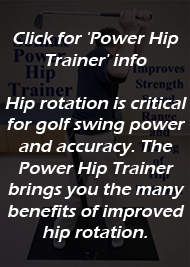 By providing resistance to hip rotation with its special, high tensile strength spring, the Somax Power Hip Trainer enables golfers to achieve the same hip speed and swing speed as the top pro golfers. One golfer who trained on the Somax Power Hip Trainer improved his average drive from 290 to 350, while increasing his number of fairways hit from 62% to 92%. By reducing the effort needed to swing the golf club, he also lowered his scores from the 90's to an index of 1.4. The Somax Power Hip Trainer has perfect 5-star reviews on Amazon. The Power Hip Trainer is only $275, plus shipping. Suitable for golfers 17 and older. For golfers who constantly tinker with their golf swing mechanics, the Somax Golf Swing DVD is the first golf DVD to show golfers how to use an inexpensive, pocket-size high-speed video camera to record, analyze, measure and improve their swing mechanics. Now they have a reliable way to improve their swing mechanics and handicap. Only $159, plus shipping. Suitable for all ages, especially young golfers learning the game. Do golfers complain about stiffness in the morning or after a round? Are You Flexible Enough for Golf? is the first golf stretch DVD to show golfers how to measure and stretch the four core ranges for the golf swing. Only $49.95, plus shipping. Suitable for all ages. 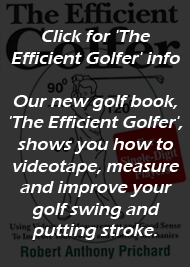 For golfers who would rather read a book than watch a DVD, The Efficient Golfer shows golfers how to video, analyze, measure and improve their golf swing mechanics, with a special section on putting. Only $39.95, plus shipping. Suitable for all ages. All products come with a 30-day money-back satisfaction guarantee. About Somax Performance Institute Since 1970, the Somax Performance Institute has helped athletes of all ages improve their performance by improving their efficiency. Their 17 Olympic athletes have won 44 Gold Medals and have set 11 World Records. Their pro golfers have won the US Open as a rookie, improved their putting from #113 to #1, quadrupled their tour income and increased their longest drive from 295 to 400. Amateur golfers have increased their distance, lowered their handicap and eliminated back pain.